Although I usually go history adventuring in my imagination and in cyberspace, yesterday I went IRL (In Real Life) and spent some time near the Estrella Mountains, which are southwest of Phoenix. If you're like most people living in Phoenix, you probably have no idea that these mountains even exist. I live in Glendale, which is due north of the Estrellas, and it wasn't until just a few years ago that I realized that every time I look south I'm seeing them. 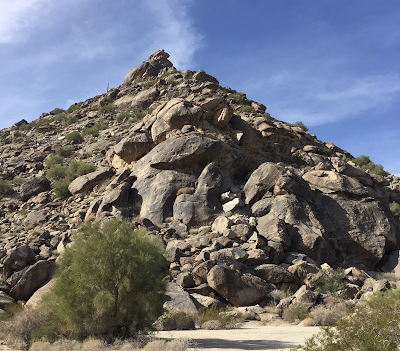 To me, like to most people, they just seemed to be more of South Mountain. And it makes sense - they're mountains, and they're south. But South Mountain (originally called the Salt River Mountains) ends at 51st Avenue. And while South Mountain is big enough to give a dramatic backdrop to Phoenix, it's nothing compared to the gigantic scale of the Estrellas. To get there, go south on 51st Avenue, probably farther south than you've ever been. That's where the pass between the Estrellas and South Mountain is. You will go through Laveen, and then Komatke. When you go past the Vee Quiva Casino, you're on Res land. That's the Gila River Indian Community, where the Pima people have lived for hundreds of years. It's been a reservation since 1859, but when I go there I look at the Estrella Mountains, and time-travel back much further. Walk with me. This is sacred ground. And I'm not just saying that as a cliche. 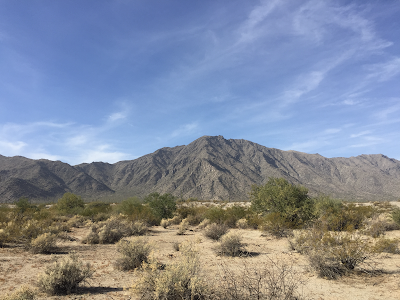 The Gila River, which runs parallel to the Estrella Mountains, was the lifeblood of the Pima people. And if you go there today, tread lightly. At the base of the Estrella Mountains, towards the southern tip. Not many people have been there, but evidence can be seen of their visits, scratched into the rock, some marks are ancient, and some are recent. When 51st Avenue begins to turn east in order to connect with the freeway, keep going south. The roads aren't paved, but 4-wheel drive isn't necessary. Yes, there are roads right through the river. Keep the Estrellas to your right, and hug them. You'll drive down into the river bottom (don't do this after a rain, or if the forecast is rain!) and with some careful driving, you'll find yourself at the base of the Estrella Mountains. Get out of your car. Take a tip from my Indian friends and shut up. Be silent. Stop talking. Listen to the silence. The loudest sound you'll hear will be buzzing of insects going by. Look up. I always look for the Face of Montezuma in the Estrella Mountains. 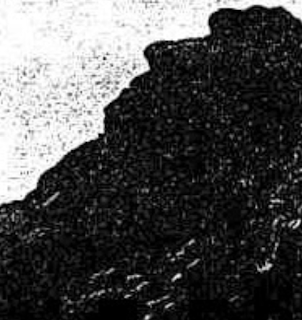 If you're familiar with the legend, it's the face that looks up (in profile) along the ridge of the mountain of an ancient Indian god who would would someday return and release the native people from the tyranny of the oppressors, going back to the time of Spanish rule. Yes, going back to the 1700s. And Montezuma still sleeps there. Where exactly the profile is isn't something that everyone agrees on, to me it's where you see it. But it's definitely there. So I'd say that you should put away your GPS, and set aside your ordinary notions of exploration, and let your mind find it. Sorry if I sound kinda mystical, but a place like that does it to you. If you go there, you'll know.